A look at the finished project. After hours and hours of design work plus hard labor building this wonderful space for me, I know Bob is glad to see this day come. We still have flooring to get down and some additional landscaping come spring. But it’s ready for me to spend my writing time there. Several months ago I posted about this project and included three images. Things definitely look different today. Here are a few photos of the Studio now. Clicking on an image will enlarge it and also provide the images in a slideshow format. Gratitude and love fill my heart. While Bob worked so hard last summer and then finished the exterior painting and clean up this last month, I was sitting in my recliner or on good days at my corner writing space. Depending on the day, I might have been prone on the bed. At times, I felt guilty he was working so hard to get this additional writing space completed. I say “additional” because as noted in my previous blog post I don’t have wifi access in my studio. This is intentional. When I’m in that space, with classical or soft jazz music playing and nature all around outside, I want to focus on writing, reading, and/or research. In the near term, I’ll be revising my memoir manuscript one last time before sending it off into the big wide world. 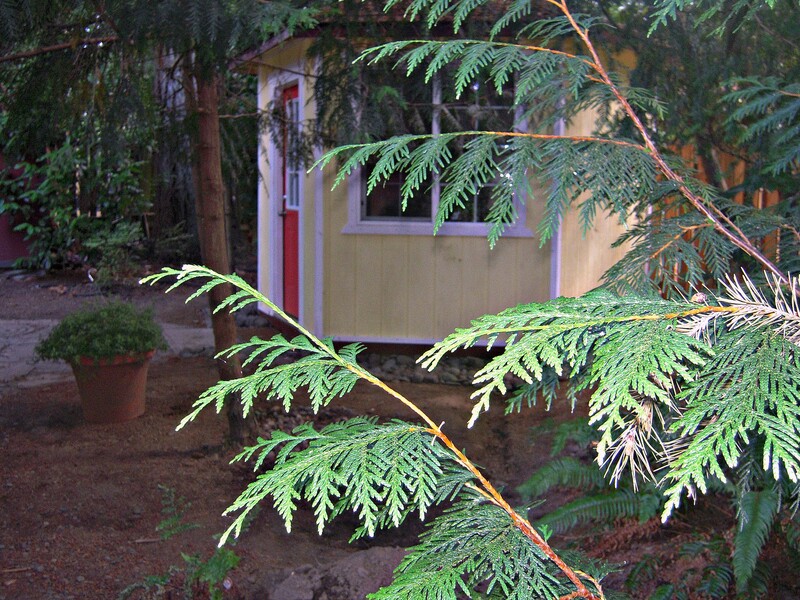 My studio will be my workroom void of distractions as I want to provide a work as near to a finished product as I can. You are owed my thanks as well. Over the past 33 months, as I struggled to stay present online and to write, so many have encouraged and supported me. I can share with you that we thought things were improving recently. For a short while, we thought we had the answers in front of us, but that changed last week with a call from my surgeon. Some days you wonder if it’s ever going to end. Continue to be the writing community you are, and it will allow each writer here, there, or wherever you spend your social media and reading time the chance to publish a memoir or a first novel or YA work. You never know whose life you have touched. Gwen, thanks so much for sharing your thoughts and words. Prayers of thanksgiving are a precious gift. Bob has made visible his love and affirmation of your writing in building this space for you. The red door suggests energy and passion to progress toward your goal. Plaudits to both of you! One day I may visit and we can toast with teacups. Marian, thanks for your gracious words describing Bob’s feelings and the door color–energy and passion. Love it! And you’re welcome to drop by for tea any day. Sherrey — Your writing studio is cheerful, cozy, inspiring, and soulful. Laurie, love your adjectives describing my studio. I may have to work those into something to hang on the wall. Thanks, friend! Lovely space and very inviting! Enjoy!! Joan, thanks for stopping by. And for leaving your lovely words. What a beautiful and creative space, Sherrey. A blessing. Linda, I love the words “a blessing.” It is indeed as is the man who built it. Thank you! It’s beautiful, Sherrey! Well-worth the wait. It’s apparent that this was a labor of love on Bob’s part. Congratulations to you both for a job well-done. May you enjoy those precious moments in your new writing space. Wishing you continued healing as you move forward. Kathy, thanks for your gracious words. I’m looking forward to getting to work out there. If it’s not enough that I’m still battling pain, now I have a cough and cold that hit overnight! Once that’s healed, out to the studio I go! Very nice, Sherrey! You have something to be proud of. Joan, you are right and I am very proud of this space. Bob has done an incredible job with the design and with the construction. It would have been easier if it had been four walls instead of six, but never let it be said Bob doesn’t enjoy a challenge! That space is super cute and cozy! That big rocking chair looks familiar, too. Use it well! Karen, not surprised you recognize the rocker. I’m honored that it is gracing my writing space. I promise to use it well! Where a writer chooses to write is a sacred space, Sherrey. It is so important to devote time to your work without the distractions of the outside world. Enjoy your special place, as I know you will.